Stars CEO Wants Media To "Write It" - Problem, Most of it isn't True. - The Point Data-driven hockey storytelling that gets right to the point. Stars CEO Wants Media To “Write It” – Problem, Most of it isn’t True. 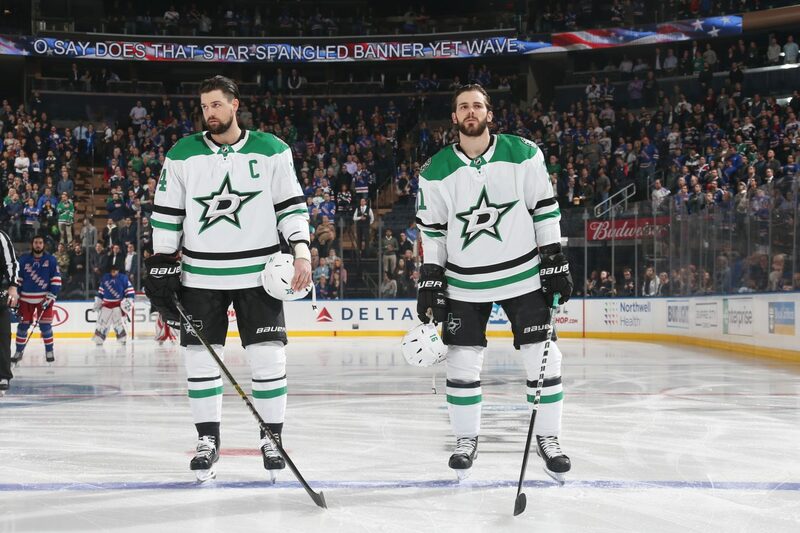 Dallas Stars CEO, Jim Lites lit the hockey world on fire yesterday by calling out two of the faces of the Stars franchise, Jamie Benn and Tyler Seguin. Lites implored the media he gathered to write about how poorly Tyler Seguin and Jamie Benn have played this season, saying, “It’s embarrassing, and no one writes it. Write it!” So, I looked into all the examples he gave as to why these players are struggling and what I found was that Lites doesn’t seem to have any problem letting facts get in the way of a good tirade. Let’s start with Lites comments, courtesy The Athletic, about the Stars most recent game, a 2-0 win over the Predators. 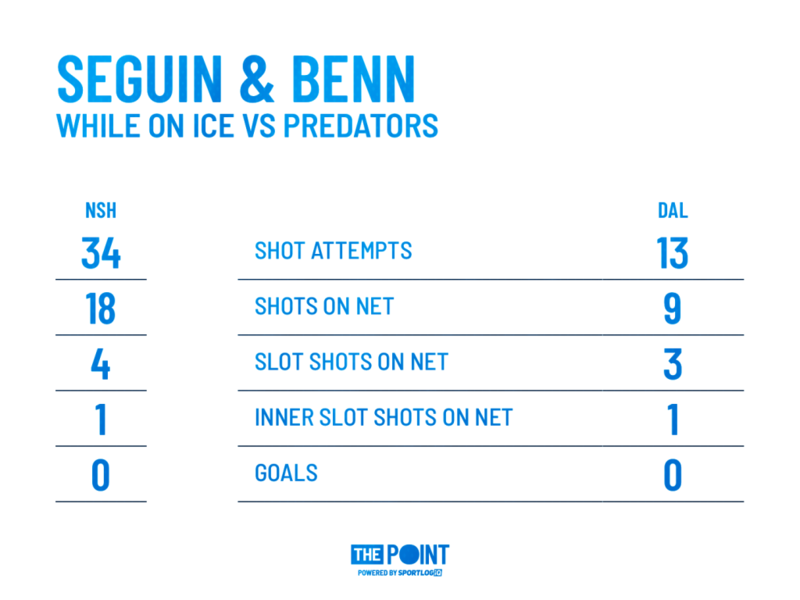 Neither Seguin or Benn registered a point in the game and Benn barely impacted the scoresheet at all, failing to record a shot on goal or a hit in over 20 minutes of ice-time. Fair. As for Seguin, he finished the game with 3 shots on goal. Not as many as Tyler Pitlick, who had 7 or Mattias Janmark, who had 5 however, all of Seguin’s shots came from the slot. In fact, Seguin’s 3 slot shots were more than any player in the game. One was a legit ‘Grade A’ chance that nearly went in, one was a good look from the left circle, one was a relatively easy glove save. To say the player with the most quality shots on net in the game was “terrible” seems like a stretch. Yes, the Stars were out-attempted heavily while Seguin and Benn were on the ice, but only on shots from the perimeter, which have about a 4 percent chance of going in. I can’t speak to how other people feel about playing against Seguin but to state the he doesn’t “go the spots where you score goals” is not accurate. The area “where you score goals” is the inner slot. 55 percent of all goals scored by forwards this season have come from this relatively small section of the ice. Seguin is averaging 0.55 shots per game from the inner slot, down slightly from the 0.7 he averaged last season. That’s a difference of about 1 inner slot shot for every 7 games he plays. To say he never goes to this area anymore is a gross exaggeration. As for the high-slot, a slightly less dangerous area but still a place Seguin can score from – last season, 32.4% of Seguin’s shot attempts came from this area. This season, 31.6% – a difference of less than one percent. Hardly justification to go nuclear on the guy for not going to scoring areas. The long and shot of it, 44.1% of Seguin’s shot attempts have come from the slot, down less than 2% (45.9%) from where he was when he scored 40 goals last season. Generating chances isn’t the problem, finishing on the near identical number of chances Seguin is generating compared to a year ago, is. Seguin is on pace to score 24 goals, 16 less than he scored a year ago. So, if getting to prime scoring areas isn’t the biggest issue with the drop in goals, what is? Seguin has hit the post / crossbar 11 times this season, 3 short of his total from last season in 44 fewer games. No one else on the team has rang iron more than 3 times this season. Also, Seguin had 4 empty net goals last season; he as 0 this year. 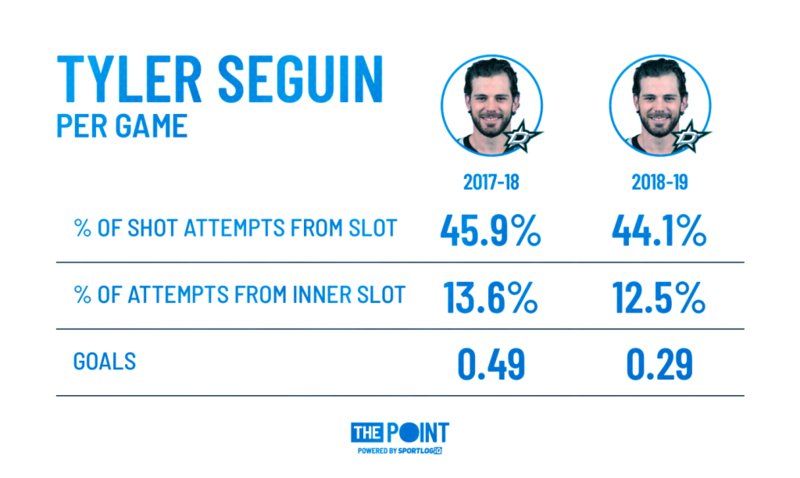 Bottom line, Seguin is generating shots at a near identical rate to last season from all the areas on the ice that matter and so long as he continues to do what he’s doing, it’s only a matter of time before pucks start finding the back of the net. I’d expect this to happen sooner than later and when it does, as convenient as the narrative of a fire being lit under him by Lites’ comments will be, the reality is there isn’t much wrong with Seguin’s process, despite what Stars management / ownership might want you to believe. Lites threw plenty of shade at captain, Jamie Benn, as well. “Jamie Benn hasn’t scored a goal from longer than 5 feet all year,” Lites said. I’m not sure exactly what Lites is getting at, Seguin isn’t getting close enough but Benn isn’t scoring from far enough out? At any rate, it’s true, 14 of Benn’s team-leading 15 goals have come from below the hashmarks. He has scored from “longer than 5 feet” as his median goal distance this season is 6.3 feet from the net. It’s splitting hairs but Benn scored a majority of his 36 goals last season from in-tight, as well. His median goal distance last year was under 12 feet. The second part of Lites quote about Benn has recency bias written all over it. Benn’s play in the neutral zone, in terms of turning the puck over, hasn’t been noticeably different from last season. In measuring how often a player turns the puck over based on his total possessions, we can calculate a players turnover rate. Last season, Benn turned the puck over on 8.7% of his neutral zone possessions – this season, 9.3%. That works out to about one more turnover for every 17 puck possessions. That’s not a meaningful difference. By this measure, maybe Denis Gurianov shouldn’t “see the light of day”, as Lites puts it, because Gurianov has the worst neutral zone turnover rate of any player on the Stars roster, conceding possession of the puck on 15.6% of his neutral zone possessions. Gurianov also has the worst overall turnover rate on the team, coughing up the puck on almost one in every four possessions. Yes, it’s a “stars driven league” as Lites stated but orchestrating a public lambasting of your two leading scorers, underwhelming as they’ve been, for not carrying a team that lacks the necessary depth to compete with top teams, is a curious move. Dallas is one of only two teams in playoff spots right now with fewer than four, 20 point scorers on the team. I get it, the NHL is a results oriented business and the bottom line is that Seguin and Benn are not putting up the numbers that are expected of them or that they expect from themselves. Lites frustration offers a window into just how little patience the organization has with the inconsistent play that has plagued the team all season and he chose to target his biggest difference makers in an attempt to ruffle some feathers. However, hyperbole, tenuous, and at times, factually incorrect statements about alleged flaws in Seguin and Benn’s game, coming from the CEO of the team, isn’t a good look.